The Combined Services Route (CSR) project is for the proposed new city rail services from Glenfield to Leppington in NSW (GLRL project). The project involves the design of about 10km of rail track including earthwork, buildings, stations, roads, bridges and all the relevant power and signal services. GHD received the previously designed rail and surface tin, and was then involved in modelling the cables consisting of high-voltage cable, signal, and communication conduits running along and across the rail corridor. The various cables were modelled as conduits arranged in combined configurations running inside the different sizes of trenches. There were several hundred pits of various sizes for cable pulling and changes in directions. There were trenches that went across and under the railway (called ULX) and also cables above the ground placed inside galvanised service troughs (GSTs). The CSR designed very often clashed with the drainage, sewerage and other objects. The earthwork, drainage and sewerage network were designed by different consultants. As a result, the CSR route changed in location and height to accommodate various design and economic requirement, almost on a daily basis. Similarly, the pits, GST and ULX moved very often. There are hundreds of Apply Many functions that generate trenches and conduits along the 10km alignment with chainage generally corresponding to the pit locations. Any changes in length of the CSR and pit location require the chainage value in the MTF to be updated. Manually updating chainage in the MTF is very time consuming. A self-updating chainage MTF is required. The configurations of the conduits are changed frequently, hence the templates need to be updated quickly. Manually updating the link in the template is time consuming and error prone. Tabulation of the template in Excel is required for other non 12d users for reference. The pit quantity and locations are also changed frequently. The pits need to be shown in 3D for visualisation. Due to frequent changes in the design tin, a drape process had to be applied to the 3D pits. 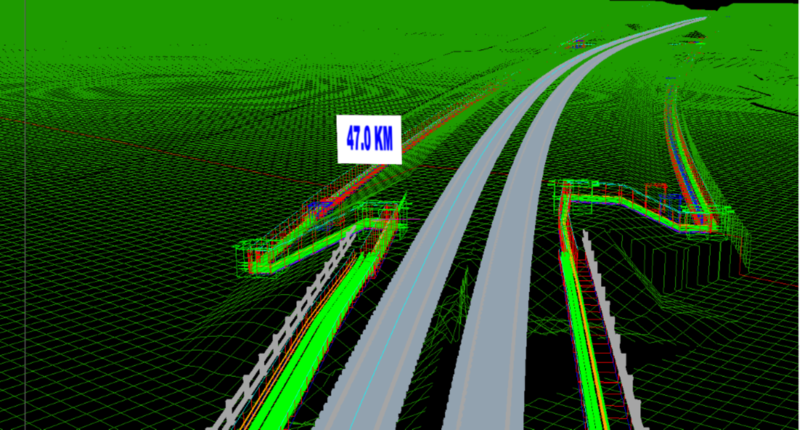 In the visualisation process, the “string drive” video ran the entire length of 10km while still be able to provide a clear visual of the underground conduits, hundreds of 3D pits and its relationship with the other objects and the finished surfaces. Both the conduits and trenches were modelled with templates running along the superalignment with Apply Many functions. There are two very long super-alignments (the Up and Down Main) with more than 10km and several shorter ones. The configuration of conduits and trench sizes are grouped by types in alphabetical order. The conduit super strings generated (which represent the HV, Sig and Com) are mapped to their respective diameter and colour with a map file. Pits are drawn in another package as single vertice blocks with individual embedded names. They are draped on the finished design surface but need to be output as 3D pits. The outputs from 12d are the long sections, cross sections, pit schedules and visualisation. Chains provided automation that sped up work and minimised error. Using the latest 12d modifier and computators, the chainages in the MTF were automatically updated with the change in the main alignment. Using computators, hundreds of marker point strings (in numerical order) were created to compute the intersections of the CSR alignment and the pit locations (the point where the type of template will change). In a chain, the resolve commands updated their locations automatically. The templates were inserted via the MTF modifiers (fixed insert: start of other strings) that start from one marker string and run to the end of the next marker string. When the MTF functions were rerun in a chain, the conduits and trenches were updated automatically without manually updating the chainages. The new conduit configurations were drawn in CAD. Initially the link of the templates was drawn as polylines in CAD by the drafting team. A simple list command extracted the info and pasted it into UltraEdit. The XY coordinates were then pasted into Excel spreadsheets that also generated the text version of the 12d templates. The templates in text format (in the form of ‘.tpl’ files) were imported into 12d. Most of the generation of templates, MTF and chains was done using UltraEdit and its scripts. Pits are imported as vertices and draped onto designed surfaces. Each type of pit carries its respective symbol. DWT files were created with the corresponding 3D blocks. Hence the exports from 12d were 3D pits with updated levels (Z-values). Later the 3D pits were re-imported (with Explode selected) into 12d Model as 3D objects for visualisations For visualisation, the using of mesh instead of texture tin enabled the underground pits and conduits to be clearly seen, while providing a feel of the design surfaces. Some structures were rendered as faces to show the solid objects. Billboards with text of the chainage (in kilometres) were placed along the master rail corridor to mark the locations. The use of 12d Model on this project has enabled on-time completion and satisfied client requirements. Although no complicated macros were used, the application was innovative, particularly in draping 3D pits, auto updates of chainages and creating templates using Excel/UltraEdit.